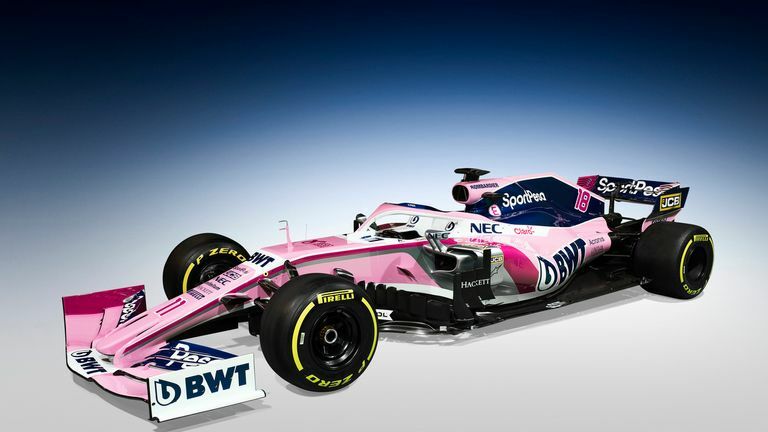 Former Force India team aiming high as livery revealed; Racing Point target return to fourth place as first step to "very top of the sport"
Sergio Perez and Lance Stroll show off the striking new livery of the 2019 Racing Point F1 car. Racing Point have officially launched their new era with the team confident they are now 'in the pink' both on and off track from F1 2019. The team formerly known as Force India revealed a reworked livery and a new title sponsor at their launch event in Canada, the homeland of their new billionaire owner Lawrence Stroll. "It's not a chapter in the history of this team now, it's a new book," said technical director Andrew Green. "With that comes expectation and we're all eager to prove if you give us a little bit more we can do a lot more." What's changing on the Formula 1 2019 cars? Team boss Otmar Szafnauer said: "The long-term aim is to take this team to the very top of the sport. We are putting the building blocks in place and it's important we take a good step forward in 2019 as we begin this new era." While Force India were long regarded as the best pound-for-pound team in F1, finishing fourth in the standings in 2016-17, they faced yearly financial strain and eventually slipped into administration last summer before being rescued by a Stroll-led consortium. "In past years we've had financial pressures, but those pressures have been lifted thanks to the consortium and our partners," said Szafnauer. "Now we have other pressures and that's to perform at any even higher level than we have before. We've performed well with the resources we have had, but the resources over time will now increase. "We want to be fighting for podiums on merit and aiming for a strong top-four finish in the championship." Sergio Perez, who starts his sixth season at the team, is joined by former Williams driver Lance Stroll, the son of Lawrence. "Our targets are really high," said Perez, the only driver outside the top three teams to record a podium finish last year. "We're aiming for at least fourth this year. I would be very pleased if we can have a couple of podiums as well - and, why not, our first victory together." The Force India name has disappeared from the grid after a decade, yet 'Racing Point' had initially appeared set to be merely a stop-gap replacement while the Silverstone outfit came up with a completely fresh identity for 2019. However, Racing Point has now stuck. "The name took us a while," admitted Szafnauer. "We started off with Racing Point as our company name and took from then to now to discuss it. We all came to the conclusion that we're a team of racers, there's nothing wrong with Racing Point and it actually encompasses who we are." One aspect of the identity which has carried over from the previous era is the predominantly pink livery which was first introduced in 2017. "The pink in the two years has become iconic," said Szafnauer. Blue has been added to the engine cover and wings for SportPesa, a sports betting company which has signed a 'multi-year deal' to become the team's title partner. Racing Point's actual 2019 car, to be known as the RP19, will be seen for the first time on the opening day of winter testing at Barcelona on Monday. Get the dedicated Sky Sports F1 channel - the exclusive home of all live F1 - for £18 a month in HD with no contract. Get Sky Sports F1.